How to find a session to watch, and what you can do when viewing. 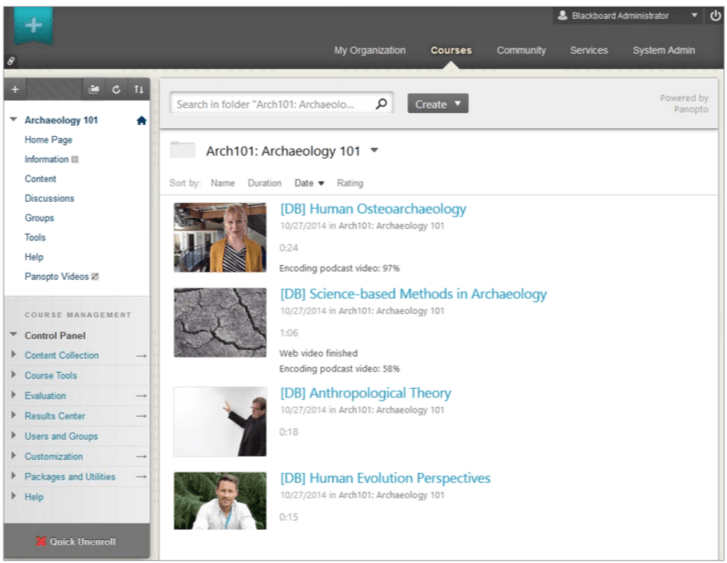 You can see links to your sessions either via Blackboard, or directly on Aston Replay. If your module uses Aston Replay, you’ll find a link in the Course Menu (the one on the left). It should be named Aston Replay but your lecturer may have named it something else (eg Recorded Lectures). 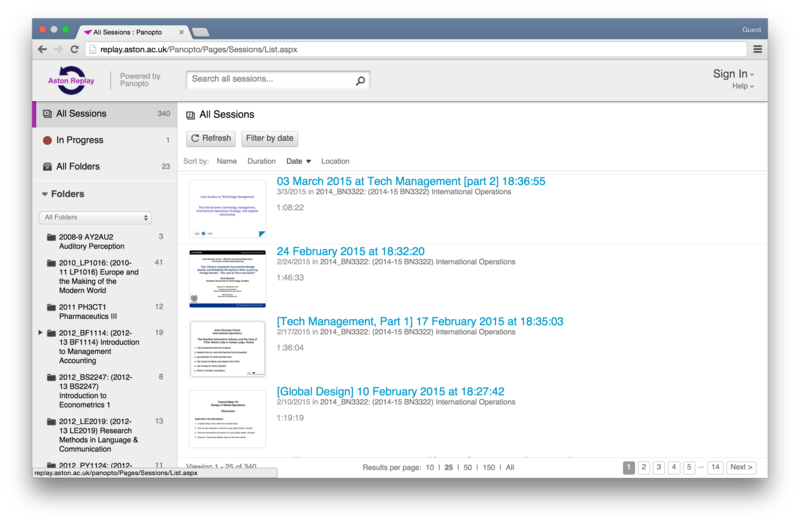 Click this link to see a list of sessions related to your module. If you go directly to Aston Replay – astonreplay.cloud.panopto.eu – you’ll have access to more features than if you used the integration with Blackboard. You can see a list of every session you’re allowed to see, narrow down the list to a specific folder of sessions, search for occurrences of a phrase in the presentation slides, view your bookmarks. If using Blackboard, your browser must not block third party cookies. Panopto’s support site has instructions on how to enable this in supported browsers. If you don’t want to enable all third party cookies, some web browsers let you whitelist a site. If your browser has this feature, add astonreplay.cloud.panopto.eu to the whitelist of third party cookies. If you don’t want to enable third party cookies, you can still get to your sessions by logging into Replay directly (see above) . These pages are focussed on viewing sessions on a desktop/laptop. We’ve got a section dedicated to mobile access. If this feature hasn’t been disabled by your lecturer, you can subscribe to podcasts of your sessions. The iPhone and iPad apps can download sessions for you to view offline. If your lecturer hasn’t disabled them, you can subscribe to the podcast feed.